Do commercial site criteria apply to personal blogs? Under the multimedia category: sound effects, effective use of music, and animation. Under functionality: use of interactivity, and does the site suit the target audience? Also, interesting links, first impression, and other strengths and weaknesses. Of course, not all of these elements would be appropriate for all websites because style would depend on the site subject matter. Would animation look good in a place that's out to look dignified, like the official Vatican site? 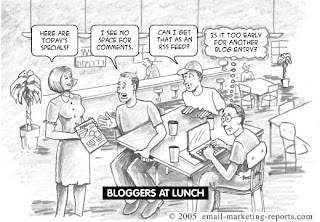 What about personal blogs? My two cents' worth is that most blogs are not out to sell anything, so bloggers don't feel the need to pull out all stops and try to ride high in the above categories. That would put on the pressure and take the fun out blogging, right? Basics might apply, but trimmings are strictly optional (or, we're just making excuses for our shortcomings, ha ha). Contd. next post. So agree ka na after you've seen the criteria! if you ask me about standards i'd say that you, as a "reviewer," should also be considerate of how the author presents his blogs. i, for one, had not used video blogs until i put my own because i knew that people didn't like to download it. the same goes for podcasts and other apps. my design, as you said, was minimalistic ...organized was my preferred word. and my ads, honestly, are placed where they are as visual breakers; not really for click generation. if you had understood how i treated these things, would you have changed your ratings? if you were to, then every blog would've been a ten. so, technically, i'd say you have to answer your own question and stand by your recourse. but i would also ask you to look at things in a broader sense - one that puts yourself in the shoes of its owner. of course, stupid blogs are stupid blogs. and great ones aren't hard to distinguish either. but as far as standards (since that's the topic), i'd say having a specific criteria would certainly be helpful not only for you to gauge your judgments but also for bloggers themselves to be able to do so.